On April 6, 1917, the United States formally declared war on Germany and the Central Powers. Unlike Europeans, during that fateful summer of 1914, the American response to the nation finally entering the conflagration raging across the Atlantic was mixed. The U.S., being made up of multiple nationalities, political identities, religious beliefs, and heritages, found its “melting pot” theory tested by the Great War. Being only one or two generations removed from the Europe, immigrant Americans–particularly those of German, Irish, and Jewish descent–found themselves caught between citizenship in their new country and the ties of heritage. 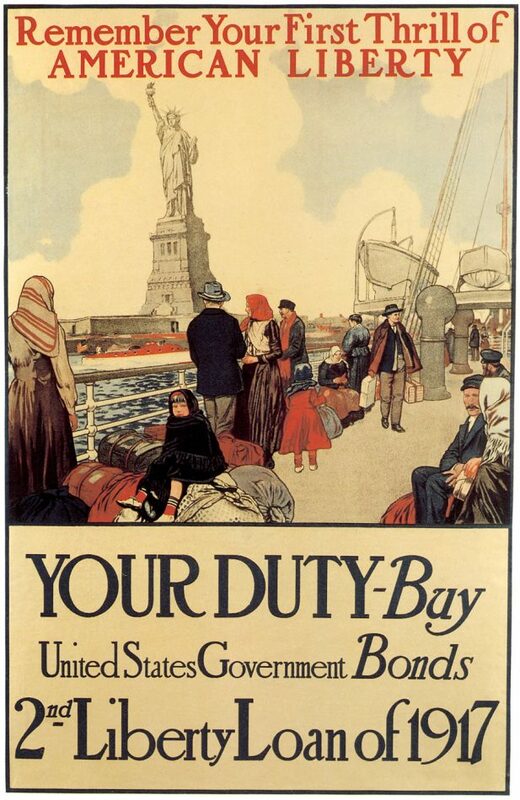 For the Irish Americans, setting aside their “hyphen” meant fighting alongside the British, and for many Jewish Americans, it meant fighting alongside Russia, whose violent and virulent antisemitism was a primary factor for their immigration. 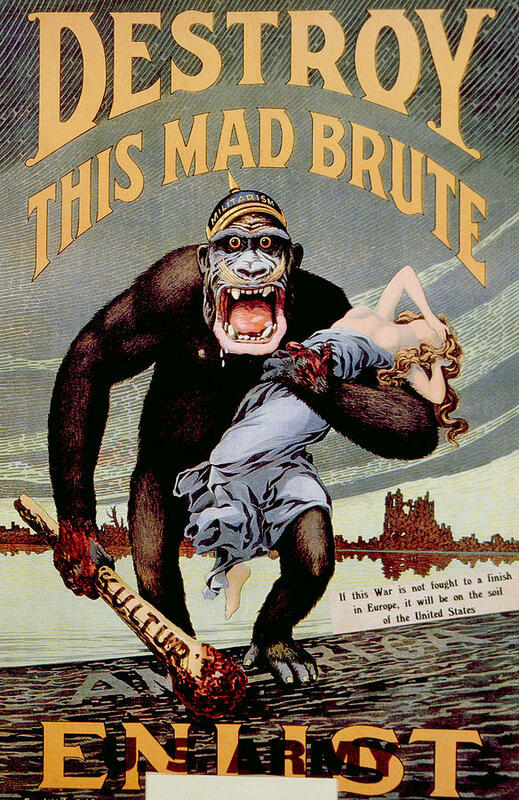 Besides the prospect of fighting their own kinsmen, German Americans dealt with the extra burden of the anti-Germany propaganda filling up the newspapers and magazines in the US and the UK, which placed the blame for the war solely on the shoulders of the Kaiser and German culture. Meanwhile, women’s responses were equally mixed. American neutrality weathered the German U-boat campaign and the sinking of the Lusitania, as well as the xenophobic paranoia of German spy plots, by the strength of women’s pacifist organizations. International peace movements linked American activists like Jane Addams to European allies. In 1915, over one thousand women gathered at The Hague to call for peace negotiations and express a large demonstration of anti-war solidarity to prove pacifism was not isolated to pockets of so-called radicals. Yet, many other American women were eager to do their bit, and filled positions in the Red Cross, the YWCA, the government, factories, etc. The most drastic change to American society was the rapid and mass mobilization of the army. 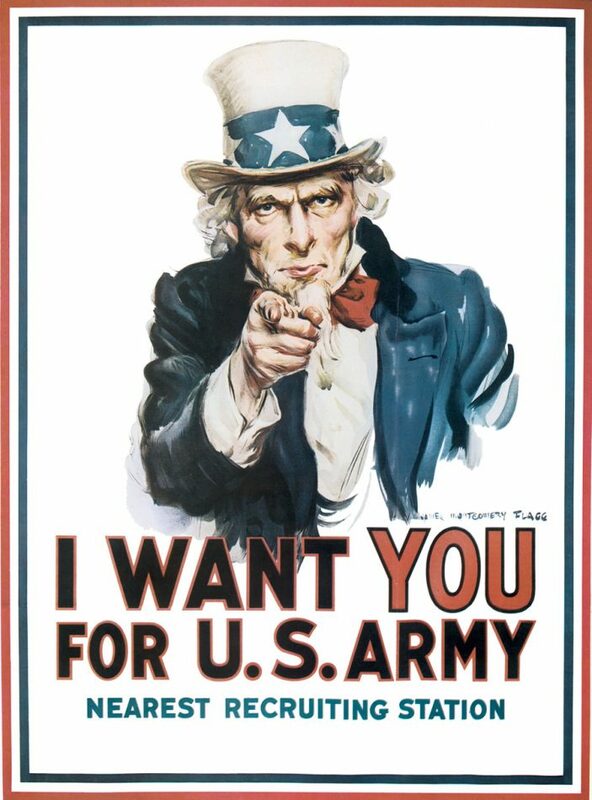 Before April 1917, the United States Army numbered only 128,000 officers and men.3 Through mass recruitment drives and the propaganda that seemed to spring up overnight, the US Army counted itself half a million soldiers strong within months. The following July (1918), there were 1.2 million American soldiers in France. Besides the Anti-Germany propaganda and the drive for more troops, the other greatest mobilization was the conservation of food. The Victory Garden wasn’t a WWII creation, but a Great War innovation, promoted first for saving foodstuffs for the benefit of starving Belgians (under Herbert Hoover’s Commission for Relief in Belgium) and the importation of goods to the Allies. 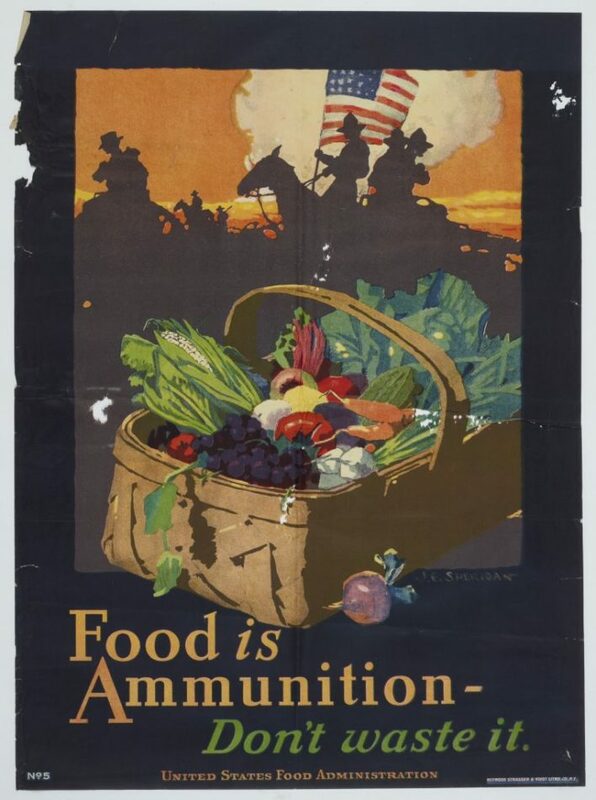 As in Britain, conservation of sugars, wheats, legumes, meats, and breads were promoted as patriotic and vital for undermining German plots–though, unlike Britain and other European countries, the US was never in danger of starving. Liberty Loan drives also occupied the American public. The selling and buying of these war bonds exerted pressure on Americans to prove their allegiance to the nation and their Americaness. Pamphlets, newspaper articles, and propaganda abounded to inform Americans of the benefits of the bond and how communities could sell the most. The increasing darker side of American patriotism during the war was an increase in xenophobia and racism, as well as extreme government surveillance. African Americans, already mistrusted by the government, found their leaders and newspapers monitored heavily by personnel, whether they were in the US or abroad. Socialists, suffragists, and labor leaders found themselves at risk of Imprisonment for their “unpatriotic” politics. 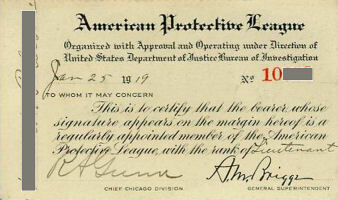 The most dangerous development was the formation of the American Protective League. A volunteer group initially formed with the approval of the FBI and the Justice Department in response to the German spy mania, the A.P.L. eventually turned to vigilantism to root out subversives to American society. With the rise of the A.P.L., neighbors grew increasingly paranoid, and anti-German sentiment was so virulent that practicality overnight, anything German disappeared. German language ceased being spoken, German food was renamed (frankfurters were now hot dogs, and sauerkraut was now Liberty cabbage), and there were even instances of lynchings. German Americans and others deemed subversive were eventually incarcerated in camps across the US. Though the United States was only officially involved in the Great War for less than two years, the experience proved to be the nation’s coming of age and eruption into modernity. This war also marked the shift in global power away from Europe (Britain in particular) to the United States of America, which set the stage for the events of the 20th century and into today. 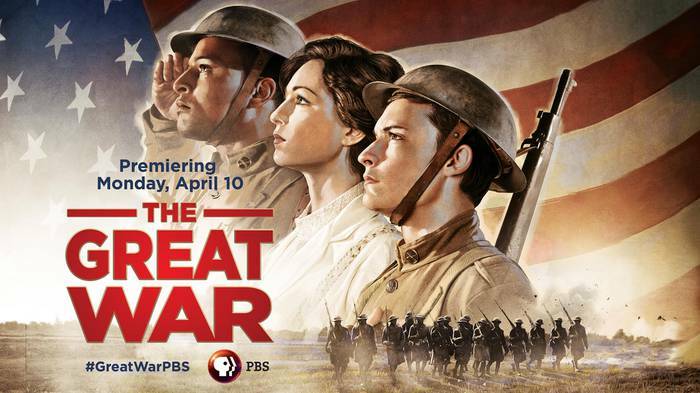 To learn more about the involvement of the United States in WWI, tune in next Monday for the premiere of the three part documentary series, The Great War. “The increasing darker side of American patriotism during the war was an increase in xenophobia and racism, as well as extreme government surveillance”. Recently I have been doing a lot of reading and writing about British Empire pacifists and conscientious objects before and after August 1914, and agree that it sounded very similar in the USA. Socialists, fathers who were the sole providers for large working families, Quakers and many other people were hauled up before military tribunals; conscription referenda were bitterly contested in the streets. Prison with hard labour was the ultimate punishment for their unpatriotic beliefs.